When it comes to German experiences, culture, and traditions, we can’t visit just Berlin and the surrounding regions – of course not. Each of the country’s federal states comes with its own culture, customs, and such, which wait to be discovered by the curious traveler. Naturally, one of the most famous regions, so to say, is the region of Bavaria – home to some of the most interesting traditions in the world and which shelters enough culture for those interested. Therefore, before you book your airport taxi Munich service and start exploring Bavaria from its capital, you should give our article a read and discover the region’s culture and traditions. There was a time when you couldn’t keep your beer in a fridge – because there were no fridges. However, in such times, people would still enjoy a cold glass/ bottle of beer once in a while. In order to ensure the coldness of their product, the Bavarian brewers used to plant chestnut and lime trees over the cellars where they kept the beer, and also spread gravel on the ground. By doing so, the cellars were kept cool and, thus, the beer remained fresh for an increased period. What started as a way for brewers to preserve their products is now part of a decree that allows beer gardens to be placed outside breweries – with beer being served there, of course. You are probably already familiar with the Bavarian traditional costumes – they appear in commercials where people drink, dance, and have a good time overall. Obviously, them dancing is not only a marketing strategy, as the Bavarian Folk dance is one of the roots of the Bavarian culture. In the past, this dance was linked to some customs, such as the sword dance, coopers’ dance, or the weavers’ dance. Basically, every guild/ association had its type of dance that resembled the modern Folk dance in a way or another. However, after the Second World War, its tradition seemed to have faded away – it was not as important as other modern dances. 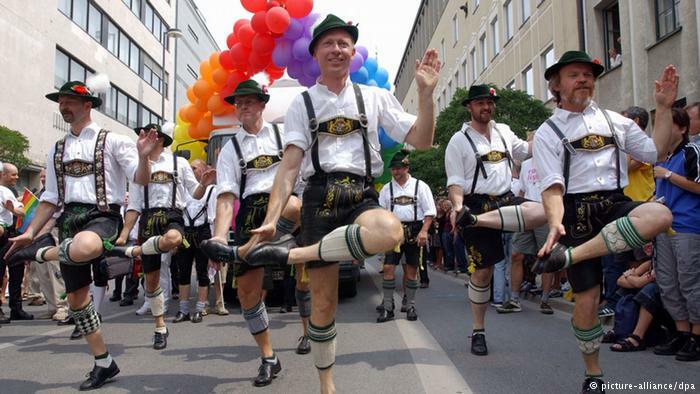 Still, the Bavarian people have revived the Folk dance, especially the youth, and are promoting it again. If you plan to visit Bavaria in Autumn, especially during September, you will be greeted by something that seems more than just tradition – cows and bulls are brought down from their pastures, located in mountains, back to the valleys and their quarters for winter. Everyone knows when the herd comes as the bells throughout several cities begin to ring – in such times, locals and tourists alike go by each side of the path the herd uses to descend from the mountains and wait patiently. Leading the herd is a Crown Cow, traditionally known as Kranzrind, which plays a very special role in Almabtrieb/ Viehscheid – it leads the other cows and bulls down the mountain and wears a traditional, elaborate headdress. It is believed that the bells the animals are equipped with will protect them from hostile demons as they descend from the mountains – once they reach their destination, each animal returns to its owner. Obviously, there are many more Bavarian traditions that wait to be discovered and experience – but it’s up to you to do so. In any case, if you plan to visit the region of Bavaria, you will surely be astonished by its traditions and culture.